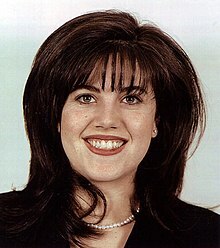 Monica Samille Lewinsky (born July 23, 1973 in San Francisco) is an American fashion designer, television personality and anti-bullying activist. In 1998 she became well known for being part of a scandal between her and then President of the United States, Bill Clinton. The scandal involved claims that she had had a sexual relationship with President Clinton. He said they had not. In the end Clinton had to admit that sexual activity of some kind took place between them. Lewinsky is of Jewish descent. She grew up in a luxury $1.6 million home in Beverly Hills. She is the daughter of Bernard Lewinsky, a medical researcher and photographer. She worked in the mid 1990s as an intern at the White House and the Pentagon. Lewinsky experimented with designing handbags and purses for her company, "The Real Monica". On December 14, 2006, Lewinsky graduated with a Masters of Science degree in Social Psychology from the London School of Economics. Lewinsky's thesis is titled "In Search of the Impartial Juror: An exploration of the third person effect and pre-trial publicity". According to her publicist Barbara Hutson, Lewinsky was interviewing for jobs in the United Kingdom in early 2007. In 2009, scholar Ken Gormley had communications with Lewinsky as a part of his in-depth study of the Clinton scandals. She said that Clinton had lied under oath when asked detailed and specific questions about his relationship with her. ↑ "IMDb.com on Monica Lewinsky". Retrieved 2008-06-23. ↑ Gerstein, Josh; Harris, John F. (December 17, 2009). "Monica's back – says Clinton lied". The Politico. Retrieved August 18, 2011. This page was last changed on 3 July 2018, at 07:39.